When I made the jump from office job to remote work, flexibility in schedule was one of my primary reasons for the switch. And, I’m not alone. A recent survey found that most workers would prefer flexible schedule options over pay raises. Would you? Since you’re reading this, I’m going to guess, yes! But seriously, as workers, we have a bad habit of scheduling our lives around our nine-to-five. We work tirelessly to make sure life happens around work, when shouldn’t it be the other way around? I think so. And I suspect you feel the same way too. Fortunately, there’s a number of companies who embrace a remote workforce that can pick and choose their schedules. Of course, this doesn’t mean you can sit on beach sipping margaritas while getting paid — just like any other job, you’ll have to work for your earnings — but the good news is, you can do that work whenever you want (as long as you get the job done, of course!). Buffer is one of my favorite social scheduling tools. They also happen to have a forward-thinking company culture that comes with a lot of benefits. When you work for Buffer, you get to work wherever you’re happiest — Starbucks, home, coworking spaces, wherever really. And if that wasn’t cool enough, they’ve also done away with formal schedules. Say what? Yep. It’s true. At Buffer, employees have the freedom to experiment with their weekly schedules, and there’s never a fixed number of hours required to work each week. Obviously, you can’t spend your days at the spa or watching Netflix non stop while collecting a paycheck. Buffer team members are expected to self manage themselves in order to get the job done. It’s as simple as that. So, whether you choose to work weekends, at night, or rise at 4:00 a.m. to start the workday, it doesn’t matter — as long as you pull your weight and make a positive contribution to the team. Rev has freelance positions available in video captioning, transcription, and translation. To get started at Rev, you’ll have to go through a series of unpaid tests. Once you pass, you have the freedom to login and accept work whenever you want. I’ve worked on their captioning projects before, and they were actually quite interesting. Most of the videos were fun to watch and the quality was also really good. Since changing up their hiring process, you can now get started captioning videos in as little as 24 hours. So, if you need money, like yesterday, Rev is a good place to start. 83bar is a company that connects consumers in need of medical services with medical providers. To do this, they use clinical contact specialists to reach out to potential patients and schedule appointments. To become a clinical contact specialist, you’ll need to be an RN. This unique position offers work-when-you-can flexibility and is perfect for RNs looking for part-time work. As a bonus, all work can be done from a smartphone with access to high-speed internet — how’s that for convenience? Want to share your knowledge with students? Become a Gradiate Genius. Gradiate Geniuses grade essays, papers and problems and also offer feedback that helps students improve. Geniuses have complete control over their schedules and can work when they want. Pay rate is $25/hour. You don’t need teaching experience to get started — a passion for helping students and great communications skills, however, are a must! You’ve got great administrative skills, isn’t it time to put them to work? At Fancy Hands, you can make use of your clerical support know-how as a remote assistant. Assistants are paid per task, ranging from $2 to $7. Keep in mind, one task should take no more than 15-20 minutes to complete. I worked at Fancy Hands for about six months. All in all, it was a positive experience. There’s tasks available 24/7, so you can login and work whenever you have some free time. Payments are issued every two weeks via Dwolla. Lionbridge is a global company that has all kinds of crowdsourced remote-friendly projects available. Some of their typical projects include search engine evaluation, map quality analyst, online shopping analyst, and data entry. And while these are all different projects, they all allow you to login and work whenever you can as long as you meet a set number of hours each week. Keep an eye on their hiring page to see what, if anything, is available. They add work-at-home jobs to their roster every month — so check in at least as often! Want to get paid to watch videos? You can at Crawford Metaforce when you work as a metadata writer. This is an interesting gig that requires you to watch archival-type videos and write a meta description to go along with it. If you’re up on your pop culture and can easily identify people, places, art, musicians, etc by sight (or a quick Google search) this is a promising position for you. The volume of work fluctuates at Crawford, but the company is pretty transparent about letting workers know what they can expect insofar as the amount of work available. This is one of the few legitimate data entry positions out there. If you can read chicken-scratch handwriting, you’ll do just fine at Sigtrack. The work involves processing voter registration information and petition signatures. Your speed and accuracy will determine how much you earn. The amount of work available at any given time will vary. This year (2016) there’s a good deal of work to go around since it’s a major election year here in the U.S. But, if you’re looking for a way to add to your income that also lets you login and work 24/7, this is a good place to get on board! When you sign on to become an agent at LiveOps, you’ll get to pick the projects you work on and set your own schedule. Projects include things like handling insurance claims to providing roadside assistance. You’ll get to pick your contract based on your experience and their current need. When it comes to scheduling, you’ll schedule yourself for ‘blocks’ of time. What’s great about this is a block of time can be as short as 30 minutes. So, if you literally have just a half hour to spare here and there, you can work from home as a LiveOps Agent. There are two opportunities to work from home at NextWave: Telephone outreach agent and writer. Both position involve politics, current events, and grassroots campaigns. You don’t have to work on projects, if you don’t want to. In fact, you select what you want to work on and schedule yourself in blocks of time. When you work from home for NextWave, it’s easy to fit the work into your already jam-packed schedule. Help others get in a good routine with their prescription medications as a Pleio GoodStart Mentor. This flexible at-home job requires you to act as a resource and reminder to people taking prescription medications. You’ll get to choose the time slots you’re available to make calls — but there’s no guarantee of work since call volume fluctuates at different hours of the day. DoorDash is a popular app that helps diners get food delivered from their favorite restaurants directly to their doors. To do this, they need people to call in orders to restaurants — that’s where you come in. This position isn’t always hiring. However, if you are hired on, you have the freedom to work when you can. Keep in mind, since most diners are placing orders in the evenings, and especially on weekends, you’ll have more work available during those peak times. Keep tabs on their hiring page to see when this position comes available! Great at online research? Become a research assistant at Wonder. Wonder is a personal assistant-like research company where busy people can submit questions and Wonder Researchers get busy finding the best answers. You’ll be paid per question answered, and can login any time you have a moment to work. Some of the top earners at Wonder exceed $2,000/month conducting online research! Babbletype is a market research transcription company. They’ve been around a long time and frequently hire typists, proofreaders, and translators to work on a flexible schedule. Each day, you’ll have the option to accept work. If you’re ready to work — great! They’ll give you an assignment. Too busy to accept anything — no problem. You’re not obligated to work if you don’t have the time. While you can work as much or little as you’d like, whenever you want, you’ll have to meet your assigned turnaround times. For transcription, this is usually 24 hours — so make sure when you accept an assignment, you can get it in before your deadline! If you’re a pro at all things involving digital engagement, you may have found your perfect flexible at-home job in ModSquad. When hired on here, you’ll be called a Mod, and you’ll get to work on different projects. This can include forum moderation to social media management. The best part is, you can select your projects and availability. They’re not always hiring, but they will keep your information on record in the event a project comes up that you’d be perfect for. Put your conversation skills to work as a Cambly tutor! No, you don’t need previous teaching or tutoring experience to get started. However, you must be comfortable talking to students from other countries over video chat. These sessions are meant to help non-native English speakers brush up on their conversational English, you know, stuff that can’t be taught in textbooks. You can login and be available any time — the tutoring dashboard will ‘ring’ when a student is looking for a tutor. It’s up to you whether or not to answer! Textbroker is a so-called ‘content mill’ where companies submit writing assignments that are filled by any number of writers. Once you get through the Textbroker application process, you can login and accept writing assignments whenever you want. Since I love to write, I still, from time to time, will login to Textbroker to see what assignments are available. Payments are issued once a week which means you can count on this as a steady source of income. In the past, I’ve relied heavily on Textbroker to make ends meet when money was tight — at my highest, I could earn $400/week churning out articles here — not exactly glamorous writing work, but it certainly paid the bills! At Pearson, you can join their Scoring at Home program and get paid to grade and evaluate exams. While this is flexible work, you will have to make a minimum commitment of 20 hours a week. It’s also worth mentioning that there are busier times of the year when work is more readily available. But, if you’re looking for something flexible that doesn’t require picking up the phone, Pearson is a great opportunity to earn from home as a test scorer. Become a Remote Image Reviewer at Shutterstock and be in charge of evaluating editorial images. In other words, you’ll be looking at pictures to determine whether they can be included in Shutterstock’s image library. To be considered you should have a love of photography and keep up on image trends. While this is flexible work, you do need to commit to 20-25 hours a week, and at least some of those hours must be done on the weekend. Part of the appeal of working from home is the added flexibility that comes when you don’t have a daily commute. But these companies take it a step further — not only is there no commute, you get control over your own schedule. And this is great because, as we all know, there’s a lot going on in life. Why worry about making it work around a traditional day job? The truth is, you don’t have to! So, whether you’re a busy mom or dad during the day, have caretaker responsibilities eating up the bulk of your time, or simply enjoy the ability to work whenever the mood strikes, you’ve got plenty of options. Be sure to check back — I’ll be updating this page as I stumble across additional companies providing work-whenever-you-want opportunities. And don’t forget to sign up below to gain access to the subscribers only resource library. Great resources Ashlee. Thanks for putting this together. There are a lot of folks who would love to work when it’s most convenient for them. This is going to give them a great head start. I love to become freelance writer? Thanks so much for your article, however you should probably note that Pearson requires a 4-year degree for all scoring positions. Thanks for putting this together, I’ve always wanted a job that offers some degree of flexibility since I plan on home schooling my daughter. Pls are any of these jobs open to people living in Africa? Nigeria to be precise. It seems that “gradiate.com” isn’t an active website, (11/15/2016). Maybe it’s a temporary issue? Thanks, Mindy. I’ll have to check it out! 🙂 If they’re no longer in business, I’ll be sure to update the post. These are very wonderful list Ashley 🙂 Thanks for sharing! Shutterstock is very interesting, would recommend it to some of my friends. Thank you Ashlee for sharing your expertise with us. I really appreciate it! I am a single mom and I would like to enroll my son in online public school soon. I found your article very helpful. Very new to researching work at home opportunities. Is this list still relevant, being published back in 2016? Thanks for stopping by! 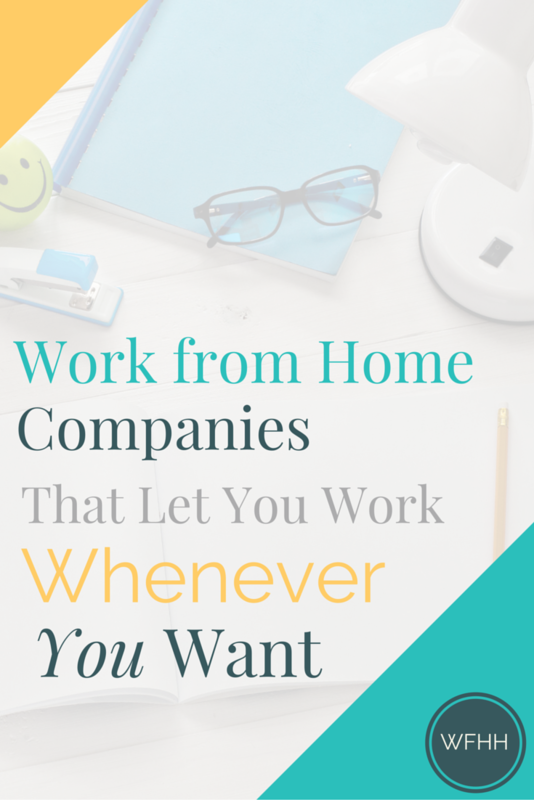 Yes, the companies on the list are still up and running and hiring home-based workers 🙂 Let me know if you have any questions as you start your work-from-home journey. Hi everyone can you quys help me for that.